The trend in the Indian subcontinent is far different from that in most developed countries, with many people drinking alcohol for the high that is associated with it. The whisky aficionados are a rarity with very few enjoying the whisky for what it really is. My relationship with the liquor has also been very similar. However, recently I had acquired an affinity for collecting whiskies and began reading on its origin and its many variations adopted around the world. And during this journey, I understood that the process involved was not only complex, but in depth and to be honest, divine. This led to a revelation… I really wanted to savor whisky to respect and appreciate its evolution during its time maturing and that led to my new found interest of whisky tasting! It’s funny how something ‘spoilt’ could have such a wide spectrum of notes that entices and excites the senses of the human body. How something as simple as nature, be it the soil, water, humidity, or temperature influence the flavor profile and how something as simple as wood can pass on its color and a host of complex tastes. Recent entrants such as Japanese and Indian whiskies have not only brought new zest but also emphasized on how flora and the natural resources can really influence the maturation process and enhance the final product. With sweet tones like caramel, butterscotch, toffee, chocolate, or vanilla; spices like cinnamon, pepper or linseeds; fruits like citrus and apple; nutty flavors like almond, and walnut…the list is just endless. Every whisky takes after its place of origin, and has its own identity and uniqueness. What is even more interesting is how the process of crafting whisky hasn’t fundamentally changed even if technology made leaps and bounds. Be it the mellowing of Tennessee whisky, or the sour mash in bourbons, the peat in Scotch and the triple distillation in most Irish, things haven’t really evolved and we can certainly see the reason why. The art of savoring does not necessarily mean your taste buds need to align with the folks you see on the Tele. The taste is what you as an individual make out of it and the path to identifying all the flavors, those subtle and those robust are yours to explore. Bottom line, It’s about you and the whisky!! 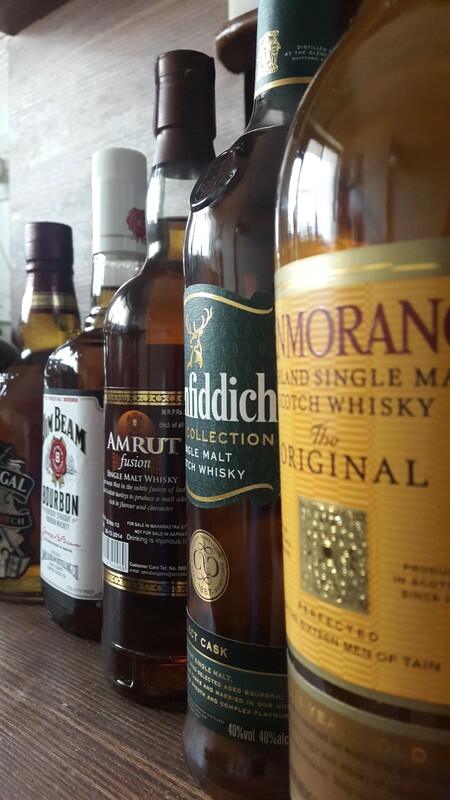 Whisky tasting can be a fun activity which embraces the history behind these liquids. And do be advised, me being an amateur taster, would lack the punch others might bring to the table. And as the same goes with whisky, I might just need that maturing! Now it seems we need to have a whiskey tasting session. Let me know when you have time. While my penchant for a long time has been sampling rather than guzzling, I’m always heartened when just one more shifts from knocking back to stopping, sniffing, savouring and gaining a completely new appreciation of the world of whiskies where less of quality is far more enjoyable than lots of plonk! Lol!! I know the feeling and ever so glad the circle is expanding!